Any help appreciated, I am very happy for you to share this stamp on other sites or media if it helps get the stamp identified. Thanks to everyone who has tried to help so far. 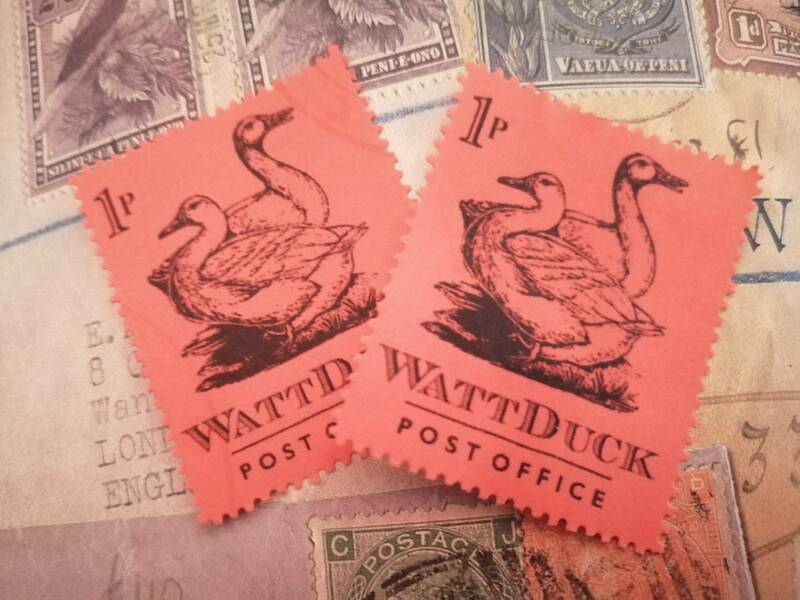 There is a Facebook page for a Watt Duck but it's an individual "Entrepreneur" not a country. There is the residual cancellation mark on the left-handed of the two. Are these stamps postally used or mint? This reminds me of my parents' 'Upduck'. They would say to us kids, 'You've got some upduck on your shirt...' and we'd say 'What's upduck' and they'd reply 'Nothing's up sweetie.."
Is 'duck' still used as a term of endearment these days? Thank you for all the private messages regarding this stamp. I have looked as best I can but cannot deduct anything from the cancellation mark, it is very faint but more due to the strength of the strike than to anything age-related such as fading, I think. The size is approx 34mm x 41mm, the paper is gummed and is red, not printed with a red background. Thanks again, any help appreciated! I should also have said that the two stamps came with a bundle of cinderellas from a show in York. That's a great picture, what is the background all about?